Download "HOUSING RIGHTS FOR DOMESTIC VIOLENCE, SEXUAL ASSAULT AND STALKING SURVIVORS"
1 HOUSING RIGHTS FOR DOMESTIC VIOLENCE, SEXUAL ASSAULT AND STALKING SURVIVORS Your landlord may not discriminate against you because you are a victim of dating or domestic violence, sexual assault or stalking. You can also: End your lease early to move quickly; Change your locks for safety; and/or Ask your landlord to divide your lease in order to evict the abuser from your apartment. National Domestic Violence Hotline National Sexual Assault Hotline HOPE Portland Women s Crisis Line for statewide help, and referral to a local crisis program Prepared by Legal Aid Services of Oregon and the Oregon Law Center (1/13). For copies of this flyer or more information about the law, contact your local legal aid office or go to our website at This pamphlet is for general education use only. It is not a substitute for the advice of an attorney. If you have specific legal questions, you should contact an attorney. 2 DISCRIMINATION AGAINST VICTIMS PROHIBITED A landlord may not treat you differently because you (or your child) have been a victim of dating or domestic violence, sexual assault or stalking. 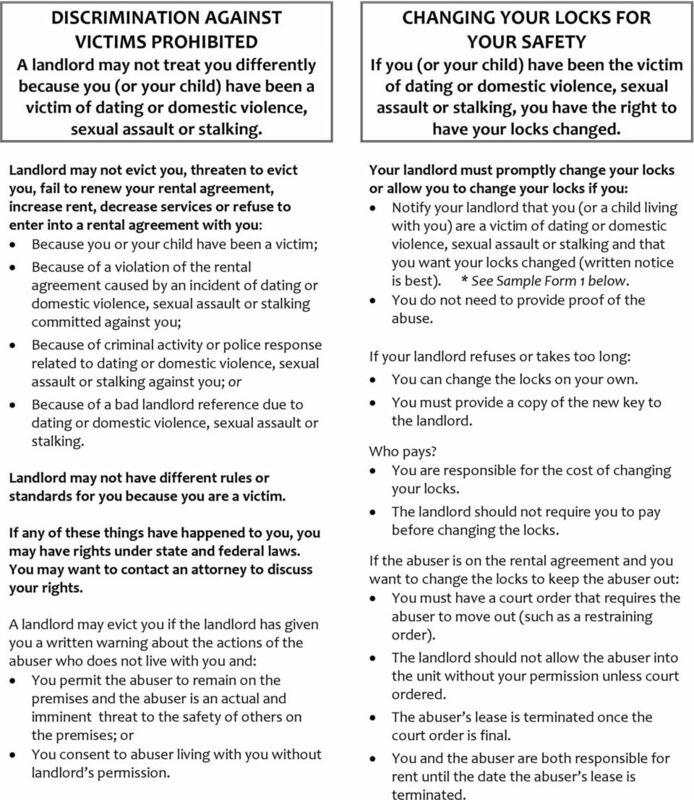 Landlord may not evict you, threaten to evict you, fail to renew your rental agreement, increase rent, decrease services or refuse to enter into a rental agreement with you: Because you or your child have been a victim; Because of a violation of the rental agreement caused by an incident of dating or domestic violence, sexual assault or stalking committed against you; Because of criminal activity or police response related to dating or domestic violence, sexual assault or stalking against you; or Because of a bad landlord reference due to dating or domestic violence, sexual assault or stalking. Landlord may not have different rules or standards for you because you are a victim. If any of these things have happened to you, you may have rights under state and federal laws. You may want to contact an attorney to discuss your rights. 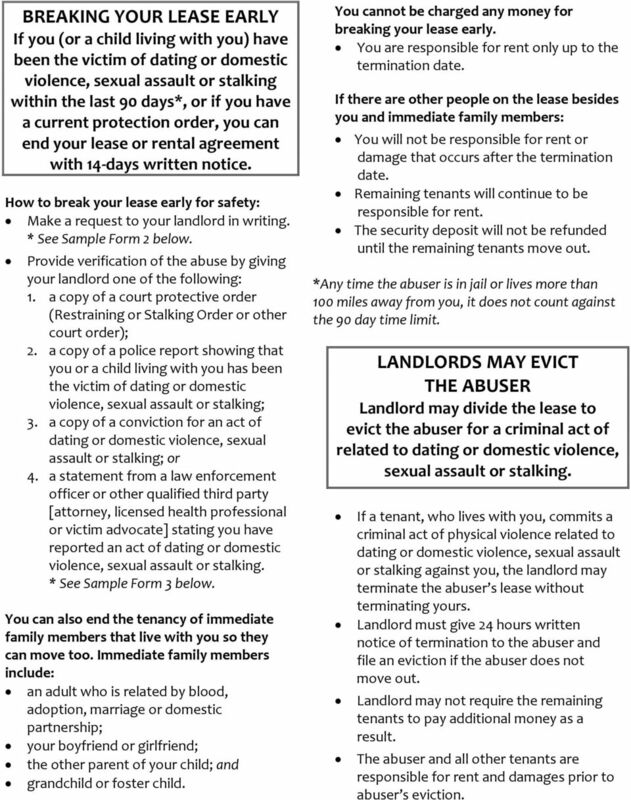 A landlord may evict you if the landlord has given you a written warning about the actions of the abuser who does not live with you and: You permit the abuser to remain on the premises and the abuser is an actual and imminent threat to the safety of others on the premises; or You consent to abuser living with you without landlord s permission. CHANGING YOUR LOCKS FOR YOUR SAFETY If you (or your child) have been the victim of dating or domestic violence, sexual assault or stalking, you have the right to have your locks changed. Your landlord must promptly change your locks or allow you to change your locks if you: Notify your landlord that you (or a child living with you) are a victim of dating or domestic violence, sexual assault or stalking and that you want your locks changed (written notice is best). * See Sample Form 1 below. You do not need to provide proof of the abuse. If your landlord refuses or takes too long: You can change the locks on your own. You must provide a copy of the new key to the landlord. Who pays? You are responsible for the cost of changing your locks. The landlord should not require you to pay before changing the locks. 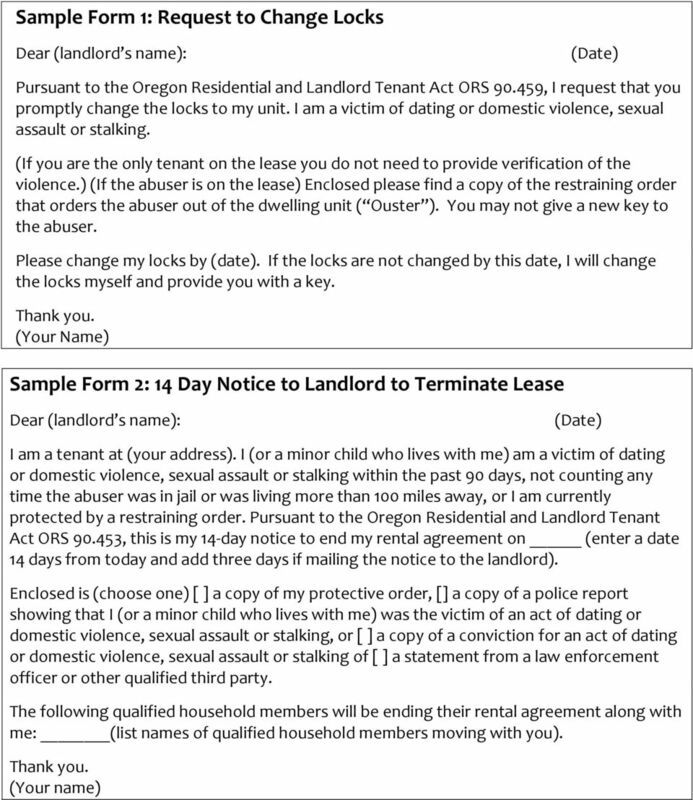 If the abuser is on the rental agreement and you want to change the locks to keep the abuser out: You must have a court order that requires the abuser to move out (such as a restraining order). The landlord should not allow the abuser into the unit without your permission unless court ordered. The abuser s lease is terminated once the court order is final. You and the abuser are both responsible for rent until the date the abuser s lease is terminated. 3 BREAKING YOUR LEASE EARLY If you (or a child living with you) have been the victim of dating or domestic violence, sexual assault or stalking within the last 90 days*, or if you have a current protection order, you can end your lease or rental agreement with 14-days written notice. How to break your lease early for safety: Make a request to your landlord in writing. * See Sample Form 2 below. 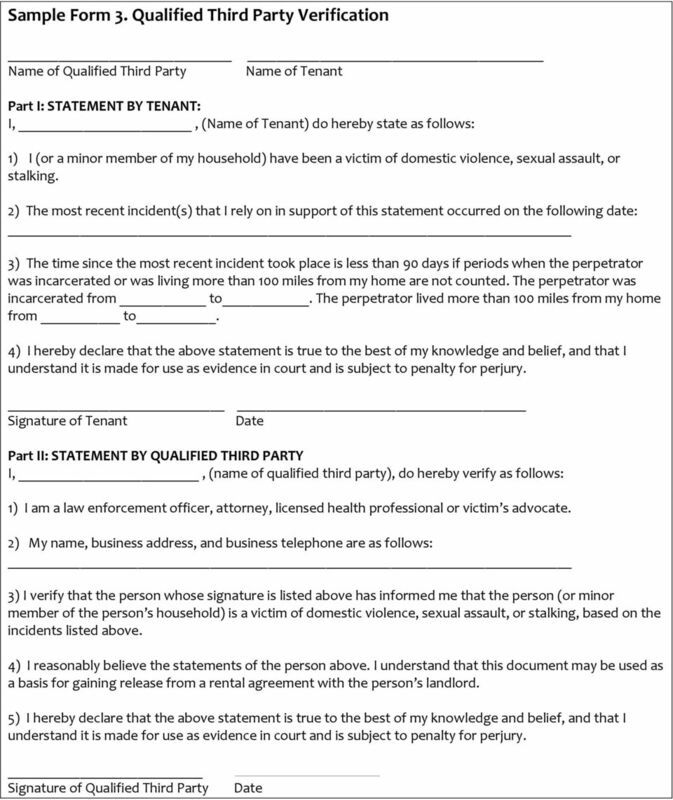 Provide verification of the abuse by giving your landlord one of the following: 1. a copy of a court protective order (Restraining or Stalking Order or other court order); 2. a copy of a police report showing that you or a child living with you has been the victim of dating or domestic violence, sexual assault or stalking; 3. a copy of a conviction for an act of dating or domestic violence, sexual assault or stalking; or 4. a statement from a law enforcement officer or other qualified third party [attorney, licensed health professional or victim advocate] stating you have reported an act of dating or domestic violence, sexual assault or stalking. * See Sample Form 3 below. You can also end the tenancy of immediate family members that live with you so they can move too. Immediate family members include: an adult who is related by blood, adoption, marriage or domestic partnership; your boyfriend or girlfriend; the other parent of your child; and grandchild or foster child. You cannot be charged any money for breaking your lease early. You are responsible for rent only up to the termination date. If there are other people on the lease besides you and immediate family members: You will not be responsible for rent or damage that occurs after the termination date. Remaining tenants will continue to be responsible for rent. The security deposit will not be refunded until the remaining tenants move out. *Any time the abuser is in jail or lives more than 100 miles away from you, it does not count against the 90 day time limit. 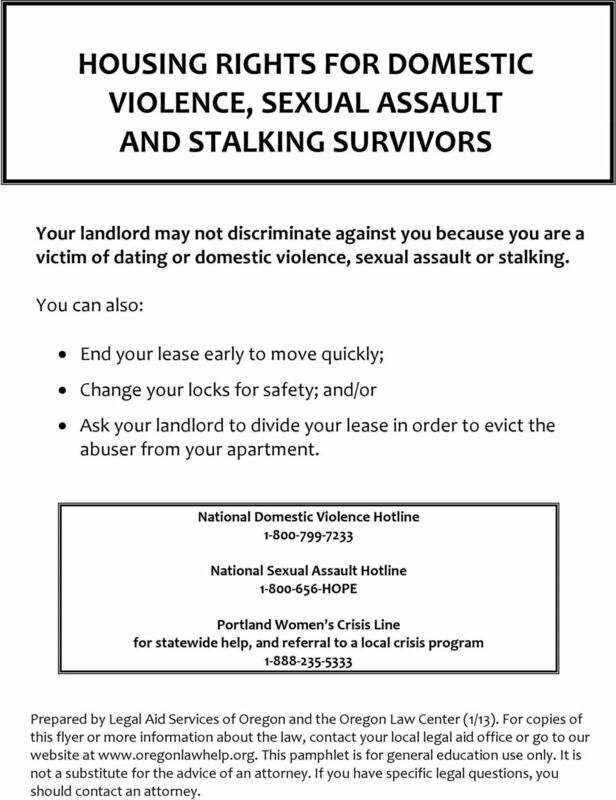 LANDLORDS MAY EVICT THE ABUSER Landlord may divide the lease to evict the abuser for a criminal act of related to dating or domestic violence, sexual assault or stalking. If a tenant, who lives with you, commits a criminal act of physical violence related to dating or domestic violence, sexual assault or stalking against you, the landlord may terminate the abuser s lease without terminating yours. Landlord must give 24 hours written notice of termination to the abuser and file an eviction if the abuser does not move out. Landlord may not require the remaining tenants to pay additional money as a result. The abuser and all other tenants are responsible for rent and damages prior to abuser s eviction. Landlord - Tenant Law in Oregon Rental Agreements Deposits Getting Repairs Done Visit our website www.oregonlawhelp.org Evictions Legal Aid Services of Oregon Community Education Series 2010 2 IMPORTANT! SUPERIOR COURT OF CALIFORNIA COUNTY OF SAN DIEGO DOMESTIC VIOLENCE RESTRAINING ORDER RESPONDENT PACKET FORMS INCLUDED IN THIS PACKET How Can I Respond to a Request for Domestic Violence Restraining Order? Thank you for choosing Village Gardens Apartments for your new home! On the Hudson River Water Front -------------------------------------------------------- OFFICE: (212) 786-1260 / FAX: (212) 786-4917 Dear Applicant: Thank you for your interest in renting at Gateway Plaza. Ginger Tuttle, REALTOR Riverstone Residential Properties Invitation Homes Phone: 786-473-4288 Fax: 786-219-3304 Email: ginger.riverstone@gmail.